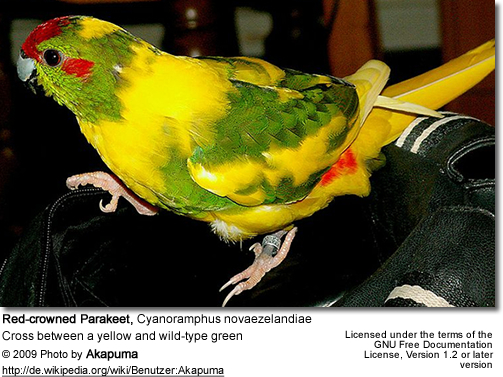 Cyanoramphus / Kakariki are generally prolific breeders and adjust well to captive conditions. The continued existence of some of the species may very well depend on setting up captive gene pools of the various sub-species to guard against possible catastrophes that could lead to their extinction in the wild. 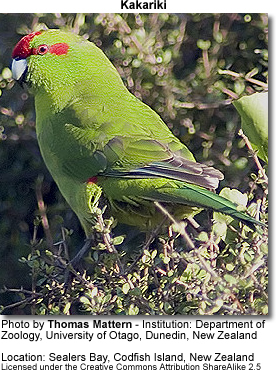 The recent decline and extinction of two members of the Kakariki genus suggests this group is particularly vulnerable. One of the major hurdles to overcome is the earlier acclimatization problem experienced with disease susceptible island sub-species. In their natural habitat, the breeding season depends on varying climatic conditions; they may basically breed any time of year, but breeding mainly occurs between October and December. Their nesting preferences vary depending on the species. Most nest in cavities of living and dead trees. However, those parakeets living on tree-less sub-antarctic islands have adapted to their environment by making their nests under large rocks and in thick vegetation. They often re-use the same nest every year. The nests are lined with small pieces of wood, feathers, moss, grasses and other dry material found in their environment. The female incubates the eggs alone and usually starts brooding after the second egg was laid. Each egg measures about 25.8 x 21.3 mm (1.00 x 0.84 ins). The incubation period is between 19 and 26 days (depending on the species and environmental conditions - the colder it is, the longer the incubation period usually is). The young fledge when they are about 5 to 6 weeks old. Although they continue to be fed by their parents for one or more week after fledging. The offspring is generally hardy. The Red-crowned Parakeet is common in aviculture and is relatively easy to breed. A clutch may consist of 3 up to 9 white eggs, which are incubated for about 20 days. Several color mutations are available, including yellow, cinnamon and piebald. In captivity, the Yellow-crowned Parakeet is well represented, both in local and overseas aviaries, although, unfortunately, it hybridizes readily with the Red-crowned Parakeet and pure-bred stock is sometimes hard to find. The Antipodes Island Parakeet nests in underground burrows that are often more than one meter long, in tussock or sedge. The breeding season is between November and January. In captivity, a clutch usually consists of two to six eggs. In the wild, only one to three fledged young are generally seen with adults. Eggs are incubated for about 26 days. The young probably start breeding at one year. There are more than 100 Antipodes Island Parakeets in captivity and generally breeding results have been favorable. 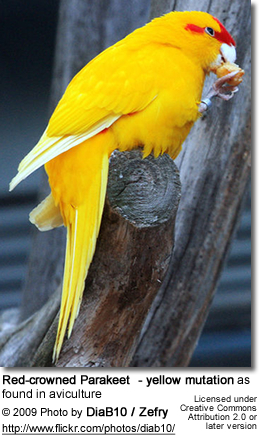 Most of these parakeets are extremely willing to breed and may be sexually mature when they are only five months old. However, it's best to prevent breeding in their first year and also avoid breeding during the winter period. These peaceful birds can be kept and bred in an aviary with other birds, even other species. Provided the aviary or flight is roomy enough to accommodate all -- colony breeding usually doesn't present any problems. Several breedings per year may be possible, but overbreeding may result in poor health. No more than 2 or 3 breedings a year should be permitted. The female often starts another clutch before her previous young are independent. The male usually tends to the previous young. Captive birds are typically confiding from the onset and tolerate other birds. These active birds enjoy being on the ground and scratching the soil, which makes them susceptible to parasites; therefore, regular worming is recommended. Minimum Aviary Size: 3.5 x 1 x 2 m (10 x 3 x 6 ft). Free flying is possible. They need protection from winter frost. A heated shelter may be necessary. Colony system with other species possible even when breeding. Provide a good quality seed mix consisting of millet, canary grass seed, oats, some sunflower (also sprouted) and hemp. They require plenty of fruit, vegetables and greenfood; as well as a regular supply of branches with flowers and buds for chewing, nutrition and entertainment. Vitamins and mineral supplements as needed, especially vitamin C in spring and autumn. Also offer grass turf with insects, small quantities of mealworms and minced or ground meat; softened bread and eggfood for rearing.